Red Sonja is one of those characters that transcends eras and it doesn't matter what time period she's in you know her sharp wit, fearlessness and bravado will show through. Such is the case in Dynamite's 'Legenderry: Red Sonja' series where it's light on the steampunk aesthetic but heavy on charm and action. It's a rip-roaring adventure worthy of a she-devil. Now working with the mysterious scarred lady known as Elizabeth or 'Lizze', Red Sonja is in hot pursuit of the mad scientist, Victor Frankenstein, responsible for the kidnappings of other prominent scientists. Her backstory starts off the issue with monster movie theatrics that still raise the hairs from the back of the neck. It's a wild ride that doesn't let up making for a fun adventure full of girl power and swashbuckling glee.The camaraderie between the Sonja and Lizzie is something you don't see enough in comics. Aneke continues to provide excellent layouts depicting some fast-moving action especially when the action heads to the high seas. Impacto Colors keeps the earth tones, except for the Red in Red Sonja's hair, in most scenes that make for a gloomy look to the proceedings. It' probably appropriate for the Victorian period to have dimly-lit interiors with a limited color palette. Regardless, the art is exceptional and serves the story well. Dynamite's 'Legenderry' series set in a steampunk-flavored alternate universe has been one of the nicest surprises this year in comics for the sheer fun in reading these adventures. It takes the reader back when comics weren't as pretentious or convoluted. It was just plain old fun. 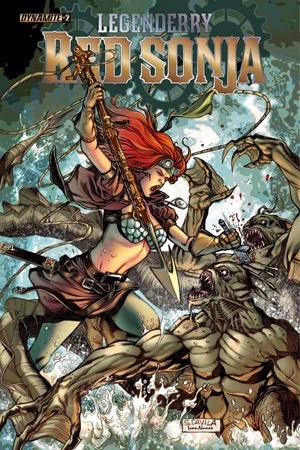 Legenderry: Red Sonja #2 is a great adventure series with one of the fiercest females in all of comics.